STIHL is now offering the impressive DuroFlex weatherproof jacket. With its lightweight and durable polyurethane outer shell the DuroFlex jacket is a must have for professionals and homeowners alike. Several features include functional air vents in the front, back and sleeves, as well as a reflective STIHL logo on the back. 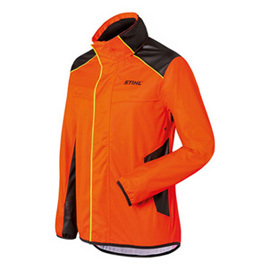 The easy to clean jacket comes in a highly visible bright orange colour. With its two waterproof pockets and an integrated stowed away hood the DuroFlex jacket is both convenient and practical.